The process of selecting candidate structures (and appropriate components of structures) for lithium treatment invariably involves sampling one or several components of the structures for laboratory investigations, particularly petrographic examination, and expansion tests (expansion tests optional). This sampling is done to (1) confirm whether alkali-silica reactivity (ASR) is an important part of the deterioration process, (2) determine the extent of the deterioration and, (3) if required, determine how much more expansion/deterioration is to be expected. Figures 1 and 2 show the types of cracking that can be a visual indication of a candidate for lithium treatment. Figure 1. Extensive map cracking in several concrete barriers along State Highway 2 near Leominster, MA. Figure 2. 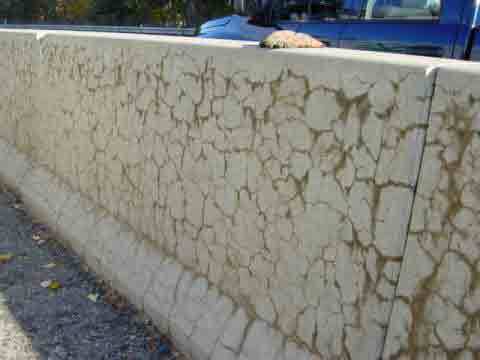 Closeup view of cracking on concrete barrier along State Route 2 near Leominster, MA. Reasons for the examination, proposed use of data obtained from the testing, and suspected problem(s). Geographical location and general description of the concrete structure and its components (affected or not affected by ASR). Dates of construction and any known information about the construction methods, traffic, loads, and environmental exposure. Previous inspection, performance, or testing reports, and/or information about any modifications (e.g., resurfacing, surface treatments with sealers or membranes) or repairs. Information on the source of the concrete, concrete materials (cement and aggregates), and the mixture proportions if known (if supplementary cementing materials, such as fly ash (type), slag, and silica fume, have been used, the proportion of each component needs to be stated). Previous analyses or tests carried out on the concrete materials. Also check to see whether samples of these materials are available for potential examination. Results of the visual survey (e.g., nature of the defects and severity and extent of the deterioration). Local/regional climatic conditions (such as annual precipitation and temperature variations) and any local observations that could relate to the presence or extent of damage and local exposure conditions. The latter might include exposure to constant or intermittent sources of moisture or to additional sources of alkalis such as deicing salts, exposure to sun, and winds that would increase cycles of wetting and drying or freezing and thawing. 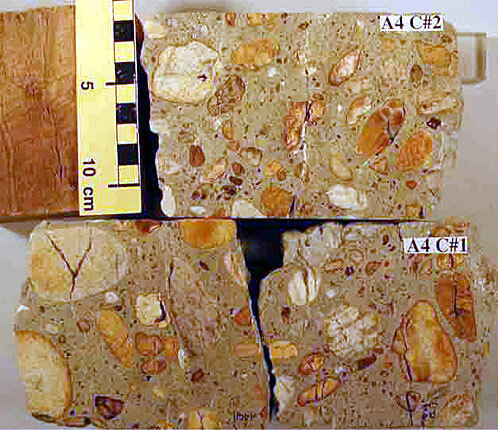 Type of samples, such as cores (preferably), fragments that were broken off with a sledge hammer or jackhammer, bags or boxes of loose pieces of deteriorated concrete, chips, or popouts of concrete. Description of the marking system used for the collected sample specimens (numbering, orientation, etc.). Location and orientation of the samples (component, local exposure conditions, severity of the surficial damage) illustrated by pictures, sketches, or plan view; depth of sampling (versus the size of the component). Reasoning used in selecting the locations sampled, including description of how the specimens were collected relative to the location of any problem areas. 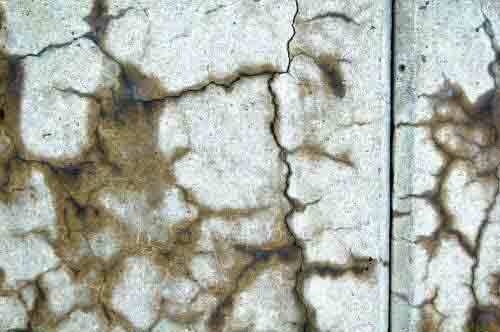 General condition of the sampled area (concrete, steel, cracks). Comments (including pictures) on core holes, sampling operations, and samples as they are removed from the placement. 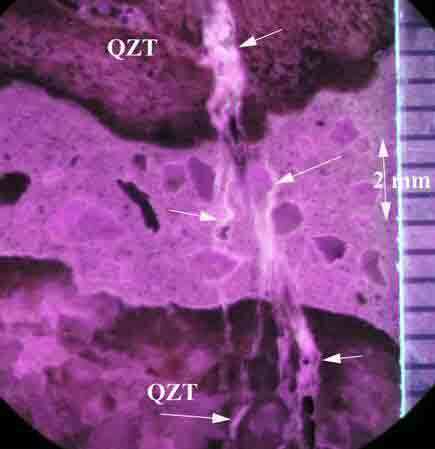 Comments on the general condition of the sample (concrete, steel, cracks, reaction rims, secondary products in voids, etc.). See figures 3 and 4. Figure 3. 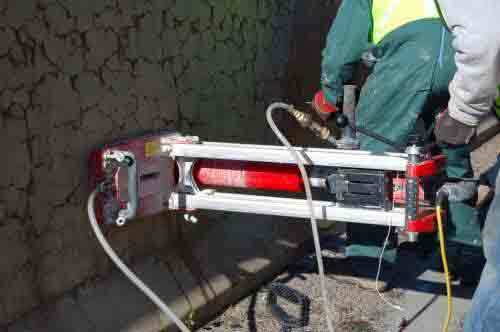 Coring equipment being used to extract a 10-centimeter (4-inch) diameter core from a concrete barrier. Figure 4. 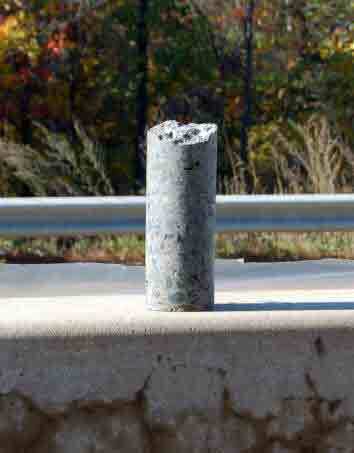 Closeup of an extracted core from a concrete barrier. Details related to precautions taken in the handling of the specimens following their extraction from the structure (storage/curing, packaging, etc.) to avoid damage. List of specialized tests or observations requested from the petrographer. Assistance can be provided to the State departments of transportation in developing the proposal, especially in the analysis of the field evidence of the ASR, the evaluation of the petrographic features of the ASR, and the mechanical testing of samples taken from candidate structures. See figures 5, 6, 7, 8, and 9. Figure 7. 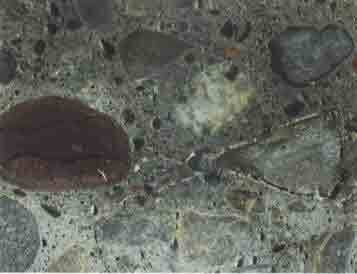 Example of a polished concrete surface. Figure 8. 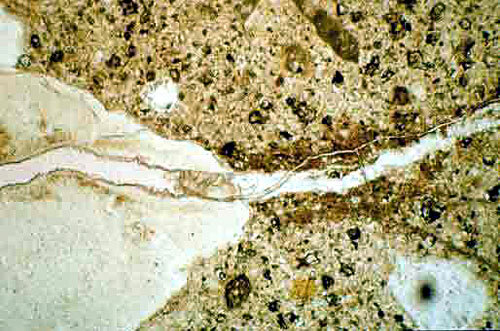 An example of a thin section concrete sample. FHWA currently is conducting a series of research activities under the lithium technology program; its research activities are overseen by Fred Faridazar. He can be reached at 202–493–3076 or fred.faridazar@fhwa.dot.gov. Federal Highway Administration. (2001). Guidelines for Detection, Analysis, and Treatment of Materials-Related Distress in Concrete Pavements Volume 1: Final Report (Report No. FHWA-RD-01-163). Washington, DC: Federal Highway Administration. Federal Highway Administration. (2001). Guidelines for Detection, Analysis, and Treatment of Materials-Related Distress in Concrete Pavements Volume 2: Guidelines Description and Use. (Report No. FHWA-RD-01-164).Washington, DC: Federal Highway Administration. British Cement Association. (1992). The Diagnosis of Alkali-Silica Reaction—Report of a Working Party. 2nd Edition. British Cement Association: Wexham Springs, Slough (UK), 44 pp. Federal Aviation Administration. (2004). Handbook for Identification of Alkali-Silica Reactivity in Airfield Pavement. (Report No. AC 150/5380-8). Washington, DC: Federal Aviation Administration. Canadian Standards Association. (2000). Guide to the Evaluation and Management of Concrete Structures Affected by Alkali-Aggregate Reaction. (CSA A864-00). Canadian Standards Association: Mississauga, ON, Canada. Federal Highway Administration. (2004). Protocol for Selecting ASR-Affected Structures for Lithium Treatment. (FHWA-HRT-04-113). Washington, DC: Federal Highway Administration. Grattan-Bellew, P.E., “Petrographic Evaluation of Concrete Cores from Massachusetts Jersey Barrier Project,” Materials & Petrographic Research G-B Inc., Ottawa, ON, Canada, May 2005. 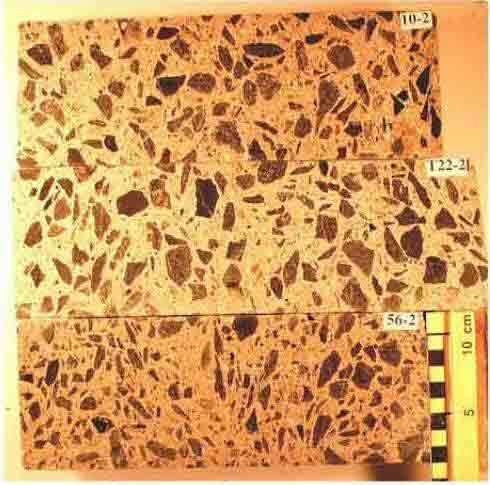 Grattan-Bellew, P.E., “Petrographic Investigation of Concrete Cores from Arches #3 and #4 of a Bridge in Alabama,” Interim Report, Materials & Petrographic Research G-B Inc., Ottawa, ON, Canada, July 2005. Researchers—This study was performed by The Transtec Group, Austin, TX. The research team includes Dr. Kevin Folliard (University of Texas at Austin), Dr. Michael Thomas (University of New Brunswick), Dr. Benoit Fournier (CANMET/ICON), and Ms. Yadhira Resendez (The Transtec Group). Availability—This document will be available as an appendix in the report Interim Recommendations for the Use of Lithium to Mitigate or Prevent ASR. This document may be obtained from the FHWA Product Distribution Center by e-mail to report.center@fhwa.dot.gov, by fax to 301–577–1421, or by phone to 301–577–0818. Key Words—Aggregates, alkali-silica reaction, alkali-aggregate reaction, cracking, diagnosis of ASR, expansion, field inspection, gel, lithium, lithium treatment, petrographic examination, prognosis of ASR.